I really like the Jaco shorts out of all the brands shown above. I like how the inseam seems to be shorter and would hit above the knees, rather than being baggy and below the knees. I'm not sure if these have a slit on the side, but I would prefer shorts that do not have a slit. The USA colors and flag stars looks good. 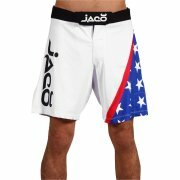 These Jaco shorts do fall a little shorter than many MMA shorts do which I find a great feature given I am short. Too often a short is too long on me which looks sloppy at times I am wanting to look my best. The short is not too short as, to me, that would be worse, but it fits me just right!